Link? Description? What is SyFY? Science Fiction channel, old chap. Something for the young ones rather than for us, I suspect! HD - High Definition: For those with eyes that still work. The music reminds me of the Queens Castle in Pat Pong , Bangkok at the end of the show. Time for a last stagger along Silom Road to the Dusi Thani. Ah right, got it. A bit like "The Philadelphia Experiment" it seems. That was a load of old tosh as well! Shortly after the film was released, a Shackleton squadron possibly caused a Final Countdown moment on another of the USN's finest. The said Squadron was on a deployment to St Mawgan to take part in the two week JMC off the SW Approaches, and was to give continuous AEW cover to the blue task group (yes - that Sqn). One of the crews decided that they would play the "War" properly, and the captain insisted that the transit out was as covert as possible - two hours at 150 feet, radar off. Also at the brief, the crew was told to look out for a Kresta II which was following one of the task groups. An hour into the transit, the captain, who fancied himself as a bit of a recognition expert, suddenly declared that he had visual on the Kresta II.."Lets go and take a photograph". The Navigator, who was an ex-AEOp and did know about ship recognition wandered up to the flight deck for a look...."Doesn't look lie a Kresta to me". Meanwhile, the Shackleton accelerated towards the ship which grew bigger - very slowly. More ships appeared and suddenly the sky was filled with two F14s followed by a Prowler as they tried to fly at the Shackleton's speed but stayed well above! The penny dropped with the Captain. "Oops its a Carrier Battle Group - never mind let's still go for a look". "Not a good idea skip - its a carrier and they are flying - not good to burst the circuit". Meanwhile, the F14s continued to circle above as the Prowler decided to drop down to try to formate on the Shackleton - now slowed down again. The mission crew flicked through a few radio frequencies to try to contact the shadowing aircraft to hear a surreal transmission back to the ship "I don't know Sir... I think its a Liberator". Discretion took over, and a 90 right slowly began to open the range again at 160 kts. Low level transits to the Fleet didn't happen again that exercise. They nearly lost a Tomcat during the filming of the dogfight with the Zeros. 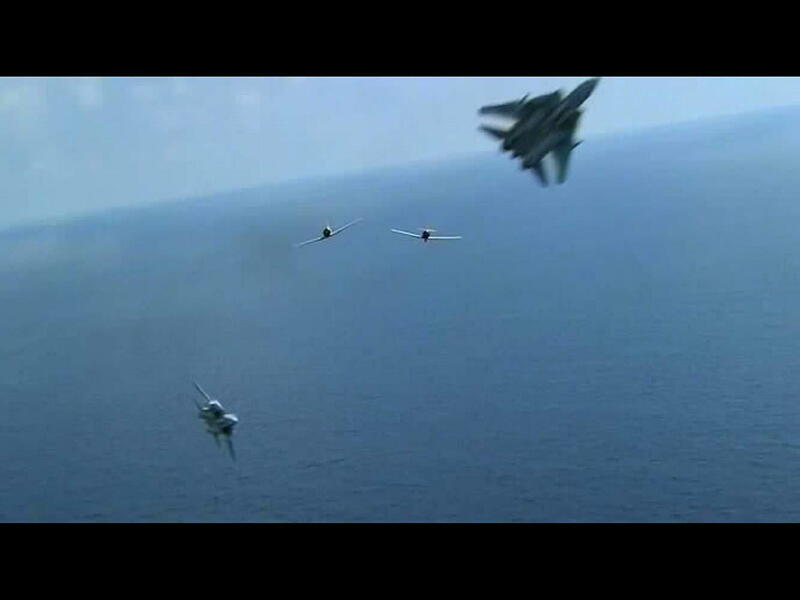 The Tomcat lost too much speed and plummeted towards the ocean, with the pilot recovering just in time. The filmakers said afterwards there was a sharp intake of breath and some mutterings from the navy top brass when they watched an advance screening. Did he fly right through his jet wash? Was he in a flat spin? Was he heading out to sea? I read they actually knocked it off for the day immeditaly after that. The F-14A was fitted with the engine intended for the F-111B, which was a bomber engine essentially. While it had a lot of power, it took a while to spool up. The aircraft was new when this was filmed, and the pilot had come from another type and was very nearly caught out. Loved the high tech piece of drift string on the Tomcat windscreen. "Splash the Zeros. I say again, splash the Zeros... This has got to be a dream." Great film, with some superb flying sequences, a terrific soundtrack, wonderful visual effects from the late Maurice Binder (he of so many Bond titles sequences) and the posing of an interesting and intriguing moral dilemma. What would YOU do with that power, in that situation? Ahhh, that'll be Zero airspeed then. Yeah, one of my best fantasy flicks. The low encounter with the waves was after a poor lag roll to get more nose-tail position and he "dished out" a tad low for my taste. Needed to get nose higher initially, then a quick roll to the Zeke's six. Five years later, the USN also helped the Top Gun movie and there was one low altitude roll and recovery that scared me. Both of those, with their good aerial segments and basic launch/recovery aboard the boat, had a good effect on enlistment here in the colonies. New Top Gun could be a nice one. Love the film and won a Monogram combined kit of a VF-84 Tomcat and the USS Nimtiz long before I saw the film, however if you look closely you will note that all of the in cockpit shots of the F-14 in the clip above are actually in an A-6!!! !